When I reached at office and then I opened my Laptop and start to checking some client mail but unfortunately every time I have seen that there is notification pop-up show again and again then I realized that there is a solution behind this, how can I stop this? I know that you also receive few update notifications from Apple App store, but if we encounter a poor network connection when updating some “BIG” apps, the update bar will probably idle and can’t be return to the same version. But the bad thing is that we can’t call off the updating the app updating bound and not even look the X mark on the button when it rocking then the button will without expression stamp in your home screen. This is actually affecting feeling. Even we look cross only when apps downloading, We can’t delete the download procedure, if you click on the cross, you will totally took out your application, Accidentally, you maybe lose the original entire application, you have to download again an finish application. So, now how everyone can cancel/ halt the application update on iPhone, iPad and iPod Touch running on iOS 6.X? There is software called “CancelUpdate” you can only install on the jailbreak device. As the name means CancelUpdate enable you to halt the update procedure and will not remove the application you download before. Anyone want this then CancelUpdate is now available at Cydia BigBoss Repo for costless. After install this tool there is no choice to configure. 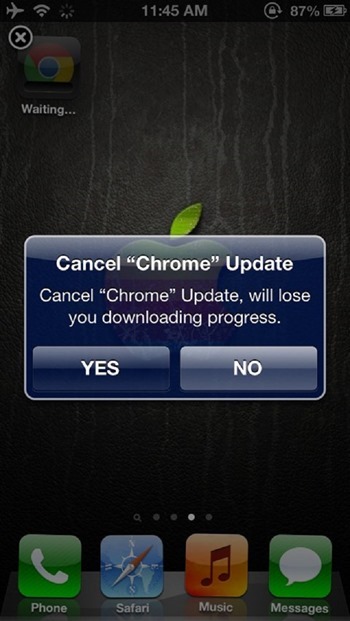 Just long press the icon of the app updating, a verification windows will open, click “YES” to remove the updating. 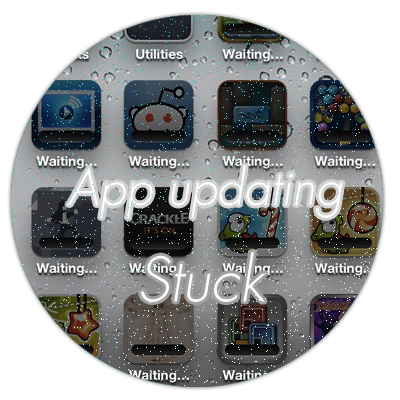 This will store numerous traffic and time to download again an application.